I am a passionate traveller and writer from Adelaide, with an Honours degree in Writing and Creative Communication. San Churros, Brace Girdles, Chocolatree, Cocolate... and the list goes on. There are many well known places in Adelaide you can head to when you specifically need a chocolate or coffee fix. However, not many people have yet discovered this well hidden gem. 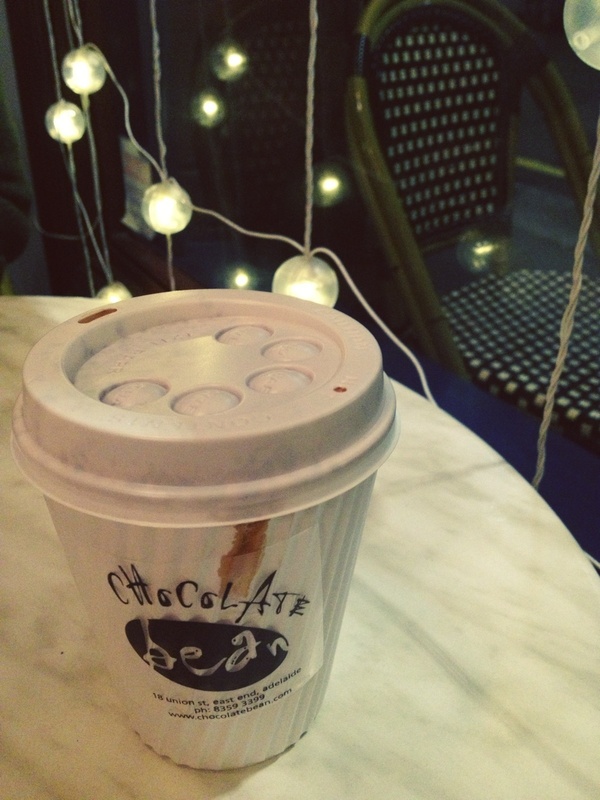 Tucked away on Union street between Grenfell and Rundle street in the city of Adelaide lies Chocolate Bean. The windows glow, enticing you to take shelter from Adelaide's chilly, wintry weather. You can sit by the window, separated from the busy footpaths but still watching the city pass by, or head upstairs for a different perspective. The coffee is good and you can even add a variety of flavours. No, the flavours are not just limited to hazelnut and vanilla like most coffee places. You can choose from coconut, hazelnut, cherry, Irish cream, butterscotch, chilli (if you dare) and even more. You have the freedom to add these flavours to any drink you order. The white hot mocha goes down a treat on a cold, rainy night, and is a nice change from the standard mocha other coffee shops offer. If you're feeling peckish Chocolate Bean can also fix that. They offer mouth-watering Turkish bread toasties and wraps, croissants and quiches. Plus if you have room for dessert, there is always a range of tasty sweets available. So if you're looking for a new hip spot to regularly visit which has atmosphere, tasty treats, healthy light meals, decently priced yet good tasting coffee along with amazing chocolate, get in to Chocolate Bean. It's all you need to keep warm and get you through a long winter.